Here are the steps to take for ordering your custom made pageant attire..
2. Fill out the order form below and make sure you include details for example color, any design ideas and shipping date etc.. Note: If you need help filling out the order form, or have questions about measuring, contact us via email or phone. 3. Next, hit the submit button on the far right before proceeding to leave your deposit. 4. $200 deposit starts your order and you can make payments on the balance, final payment is due 30 days before the garment is finished and mailed to you. Please allow 5 additional days for mailing priority USPS mail. If final payment is delayed, your shipping date will be moved to next available opening. 5. Customer is responsible for all shipping charges. Shipping is $35.00 for USPS or UPS. We also ship using FedEx, and overseas, contact us for a shipping quote. 6. No refunds on custom made garments,ready-made items, deposits or payments made. Deposit is good for one year. Changes need to be made with in 7 days of receiving garment, satisfaction guaranteed. Thank you. 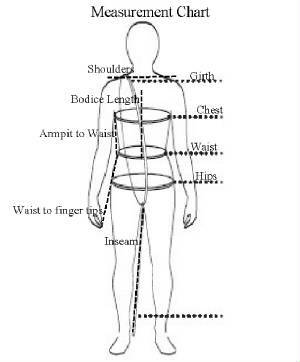 Girth (for swimwear/costumes) Right shoulder throught legs and up to shoulder, torso measurement. Half Girth (Swimwear bottoms) Belly button,thought legs to above buttock.